The Imperial fora are a number of Roman public squares in the city of Rome. They were built between the first century BC and the second century AD, during the later Republic and early Empire. They should be distinguished from the older Roman Forum, which lies nearby. The Imperial fora were important centers for economic, political, and religious life, with many discussions regarding important topics of the time being held there. The first forum to be built was that of Caesar, which was inaugurated in 46 BC. It was, however, incomplete; the final touches were added in the time of Augustus. This forum began as an offshoot of the existing Roman Forum, and was intended as a tribute to the power of Julius Caesar himself. It included a Temple of Venus, since the dictator’s family held that he was in a direct line of descent from her, as well as a large equestrian statue of Caesar. The second forum was that of Augustus, which received its inauguration in 2 BC. The ruler is said to have built this forum to avenge his predecessor’s assassination; the temple here is thus dedicated to Mars, the Avenger. The Forum of Augustus stands at right angles to that of Caesar, and is noteworthy for the height of its walls. At one time there were probably exedrae at either end of the facade, but these have disappeared. During the reign of Domitian in the late first century AD, a third forum was added; this connected the earlier fora with the Temple of Peace. This temple had been added after the conquest of Jerusalem in 70 AD. The forum of Domitian would have been dedicated to Minerva, but it was completed after the emperor died and the new ruler, Nerva, decided to give it his own name. The constraints of its location give it a distinctively narrow shape, but it has a wide entrance. The final and largest forum in the complex is that of Trajan. It was built in order to mark Trajan’s annexation of Dacia. As well as being a public square, this forum included a Temple of the Divine Trajan, a pair of Greek and Latin libraries, and the Basilica Ulpia, which measured around 550 by 200 feet. Some of the basilica’s columns have survived, as has the associated Column of Trajan. At 140 feet in height, this column rose to where the hill had been before the required excavation. 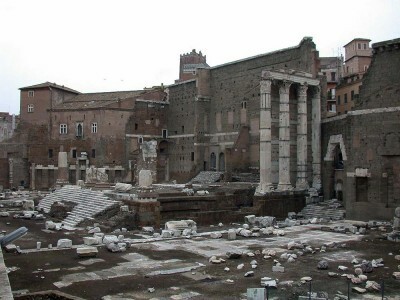 Trajan’s Market was adjacent. Many of the Roman structures survived the fall of the Western Roman Empire, although the surrounding land became marshy. However, significant damage was done to the sites as Rome’s population increased in early medieval times. The ninth century saw significant house building and the ruins were quarried for their high quality marble. The Temple of Minerva, in the Forum of Nerva, was destroyed in 1606 when Pope Paul V decided to use its stone for a chapel and fountain. The 20th century Fascist leader Benito Mussolini associated himself with the splendor of Ancient Rome. Hence, he carried out some restoration work on the fora. However, his decision to construct the immense Via dei Fori Imperiali across the site proved to be extremely damaging. Much of the complex was buried under the road, while the pressures of modern traffic have led to damage to the remaining structures due to pollution and vibration.